THE BOOK: Faithfully Yours: The Amazing Bond Between Us and the Animals We Love. THE PUBLISHER: Paraclete Press http://www.paracletepress.com. SUMMARY: Heartwarming true stories about amazing animals and the people who love animals, with chapters on devotion, acceptance, compassion, guidance, and more. Meet everyday heroes, such as the husky who escaped his house in order to visit his owner in the hospital, the cat who ministered to stressed-out college students, the gorilla who protected a little boy who fell into his enclosure at the zoo, and the miniature horse who guides a blind teacher….as well as compassionate people who heal, rescue, protect, and care for animals. Faithfully Yours explore “the amazing bond between us and the animals we love” and how that bond mirrors and enhances our relationship with God. For anyone who’s ever experienced the life-altering love of–and for–a furry companion. THE BACK STORY: I write true stories for Guideposts magazine, and was intrigued by all the inspiring ways dogs, cats, horses and other animals help people. Not only do we rescue animals, but often, animals rescue us. My own dogs remind me of this every day. I researched a lot of stories, and the book took about a year from idea to print. WHY THIS TITLE? : I initially entitled the book Greetings at the Front Door, because I thought the way dog reacts when his person comes home exemplifies the close bond we have with animals. But the editor changed the title. We tossed around a few ideas and eventually agreed upon Faithfully Yours. WHY WOULD SOMEONE WANT TO READ IT? : The book helps strengthen our connection with all animals. Faithfully Yours is not only true animal stories, but also stories about dozens of people who are dedicated to protect, heal, rescue and love animals. “Blissfully engaging and full of love. 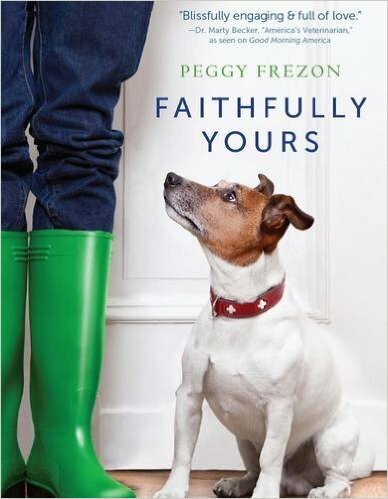 Faithfully Yours beautifully conveys the connection between animals and their people. A heartwarming must-read for anyone who has experienced the power of this bond. —Dr. Marty Becker, “America’s Veterinarian,” as seen on Good Morning America and The Dr. Oz Show. AUTHOR PROFILE: Author of books about animals. Regular contributor to Guideposts magazine, and contributor to more than a dozen Chicken Soup for the Soul™ books. Stories also appear in books such as “Animals and the Kids who Love Them,” “The Ultimate Dog Lover,” “Miracles and Animals,” and others. Blogs at The Writer’s Dog http://peggyfrezon.blogspot.com. My husband and I rescue senior dogs, and share our home with a 13 year old spaniel, Kelly and a 9 year old golden retriever, Ike. AUTHOR COMMENTS: “I hope readers will take away from the book a sense of awe at the capacity animals have for loving us. And it might inspire people to go forth and follow through on some desire they may have for rescuing animals, volunteering in a shelter, or helping a cause. “What I took away from writing the book is that not only are animals amazing in their capacity to care for us, but also so many people are amazing in what they do to care for animals. I love dogs! There’s never been a time in my life I haven’t shared my home with at least one canine companion. But the pooch my husband Mike was gaga over on the pet rescue group’s website was absolutely the wrong dog. And this was definitely the wrong time. Mike had just been released from a lengthy hospital stay with a serious condition. Blood clots lodged in his pulmonary artery had almost taken his life. I finally got him home and couldn’t stop worrying about his condition. He was weak and needed his rest. Instead, he spent all his time staring at a website, pining away for a dog. I leaned over his shoulder and sneaked a peek at the screen. The large retriever’s golden fur looked like it had been shaved, probably due to matting or allergies. His long limbs appeared knobby and wobbly. His teeth were crooked. His sad eyes told me that he’d been through a lot. His expression was deep. Pleading. Irresistible. But, no! His age! The website stated that he was eleven. I’d never had a dog live past twelve years old. I wanted to help him almost as much as Mike. Then I got practical. Old dogs were more likely to have issues with their health. Brittle hips and bones. Respiratory, digestive issues. Cataracts. I already had Mike’s health to worry about. Although we weren’t senior citizens yet, it wasn’t that far off. When had I ever been able to “just look” at a dog and not want to take it home? Mike knew me well. How could he not after thirty years of marriage? The next day Mike arranged for us to meet the rescue worker in the parking lot of a nearby pet food store. He beamed as we left the house, his step livelier than I’d seen in weeks. My step lagged. “Let’s hurry before someone else claims him!” he said. Not likely. Slim chance anyone would jump to adopt an eleven-year-old dog. Puppies went fast. Not so for older dogs. His coat was dull and patchy. His ribs stuck out. He averted his eyes, and I wondered if he was even capable of making a connection. He needs a home, to be sure, but we aren’t the right home. I stooped low and he slowly turned his head toward me. When I touched him, he didn’t budge, as if he’d lost all hope. Then I noticed his tail. A tiny movement, a hesitant wag. There was some hope, yet. Abandoned. Homeless. Unwanted. My heart lurched. I reached down and surrounded his neck with my arms. “Poor boy. Sweet, sweet boy.” This time he moved. He leaned into my touch. His muscles relaxed against me. It felt as if he melted, fully trusting to become one with me. I glanced at Mike. He was a goner, his eyes as pleading as the dog’s. I stroked the dog’s head again. When I stopped, he pushed his nose into my palm, asking for more. Mike was right. Even though I wasn’t sure about adopting an old dog, I couldn’t say no. When we got home, we introduced our new friend to our spaniel, Kelly. She wasn’t thrilled, but she accepted him from a distance. We’d work on that. We named him Brooks. That afternoon Mike and Brooks relaxed together, Mike in the old recliner chair, Brooks on the floor at his feet. Later, they took a walk. “Not too fast,” I called. Turns out there was no need to worry—Brooks and Mike had about the same pace. In the evening, Mike stood at the kitchen shelf, preparing his medications. Brooks needed steroids for a skin condition. “Come on,” Mike called cheerfully, “us old men have to take our medicine.” Brooks trotted up and took the medicine right out of Mike’s hand. Mike leaned over and kissed him on the nose. Brooks. When Mike rested in his chair, Brooks curled up on top of his feet. He followed Mike from room to room, and lay down by the door to wait for him if he went out. Even though the old dog had been abandoned and unwanted, he had a heart full of love. A love that helped him heal and helped Mike heal as well. Watching Mike and Brooks together, the heavy grip of worry that surrounded me began to fade. Life isn’t just about an age, or being healthy or sick. It’s about trusting God with all of it and living fully. I went to Mike and gave him a hug. Then I hugged Brooks. He softened against my side, fully trusting. Fully loving. Brooks lived with us for about a year, until cancer took his life. He was a beautiful example of unconditional love. To me, this means that dogs have a capacity to love fully, even if the world has treated them unjustly. Barnes & Noble, Wilton, NY. Signed copies available from the author.